Creating this custom worksheet only takes five minutes. 11.02.2019 21:12:47 - Previously only available in german language, the worksheet generator for mathematic problems is now available to teachers and tutors in english speaking countries. 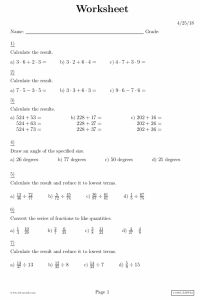 (live-PR.com) - Dirk Wriedt Math Worksheets today announced the launch of the english language equivalent of the much acclaimed service dw-Aufgaben which has been making the life of teachers, tutors and nannys easier since 2012 by providing custom generated math worksheets. comes with repeating the application of problem solving approaches over and over. This is why math teachers and tutors are always in need of worksheets they can provide to their students or clients. The worksheets that can be obtained from most web sites are static in nature, there are never enough of them for extended practice and the skill level can not be adjusted properly. dw-Math problems are customizable in many ways, and different problems can be arranged on a single worksheet. Single problems or even the whole worksheet can be refreshed with a single click, and every refresh will give different problems that are instantly shown on the preview page. Creating customized worksheets with an appropriate skill level for each student takes not hours but only minutes with this service. With every worksheet, a solution sheet is provided. Teachers who need math worksheets for their class for practice, would like to provide worksheets with different levels of difficulty to provide their students with appropriate learning materials, like the idea of always having some spare worksheets at hand to supply quick performers with additional work, quickly need some materials to work on for a stand-in class, are sick at home and want to provide their stand-in colleague with math worksheets to allow them to use their class time effectively, would like to prepare a quick written test to assess your pupils' tatus, or math tests with the same set of problems but different numbers will save a lot of time without having to make use of simple prefabricated stock worksheets. Tutors will find that their needs for math exercises to review their student's abilities or whose tutor group members are asking for additional materials to work on in their spare time will now be able to produce the required materials just by choosing the required problems from a wide selection. Parents may be in in need of math exercises for their children together with answers so they can review them together. They will discover that their child will be able to to improve their proficiency at applying their math knowledge just by practicing using worksheets with increasing difficulty levels. People who are specifically looking for math worksheets with solutions because they are not sure about their own skills when explaining something will find it easier to talk about problem solving. This service is provided on a web site platform, no so software installation is required. Users can submit proposals for new problem types to a wish list. Worksheets are provided in pdf format to allow for printing or distribution by email. Visit www.dw-math.com for a free trial and browse several hundred prefabricated worksheets ready for download. For these free worksheets, there is no registration required.